A.E. Sampson & Son produces wood flooring in as many varieties as ice cream has flavors. Co-owner Paul Sampson runs down the list. “White ash, sugar maple, cherry, aspen, butternut, red maple, ‘roasted’ or heat-treated birch, ‘red’ birch, red oak. African mahogany, South American mahogany, teak, walnut, wenge, white birch, white pine, longleaf pine… ” He’s looking at the list in his mind. Paul and his wife, Jula, offer variety because customers ask for it. But Sampson promotes Maine woods as a cause. It’s his life. A.E. 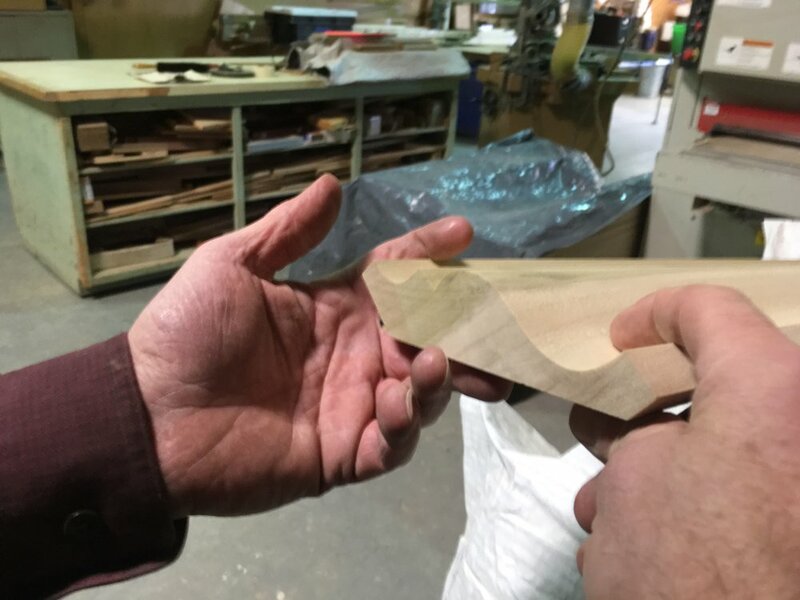 Sampson keeps five employees busy producing flooring, corner moldings, baseboards, stair treads and risers, balusters, stair handrails and other products. Some 8,000 lineal feet of wood products are produced daily. The 17,000 square-foot shop is crowded with ripsaws, molding machines, and planers. Dust collection keeps the mill spotless. Rolling carts hold rough lumber to be fed into machines, and the neatly stacked finished product—stamped with the A.E. Sampson & Son logo. Sales are about $1.25 million a year. Sampson is in a hardwood business in a state best known for its softwoods—pine, spruce, fir. He buys as much wood from Maine as he can. “I like to practice what I preach,” he said. Shorter lengths of white oak come from Maine, longer lengths from elsewhere. Lower grades of cherry come from Maine, higher grades from Pennsylvania and New York. Sampson’s best-selling Maine wood is “red birch,” the reddish heartwood of yellow birch. “Red birch has been our most popular wood for years. Until two years ago it was our biggest seller, when white oak took it over. But based on sales, I think red birch is going to take the lead again,” he said. Sugar maple is also popular. “It goes in spells,” he said. “It seems to be back now.” Maple doesn’t do as well under radiant flooring, he said, which cuts into sales. Despite his efforts, Maine-sourced woods account for only 30 to 40 percent of his business. A minority of builders really cares where the lumber comes from, he says. “For most it’s all about time and price. For the 10 percent that do care about it, they really care about it and have built their business around it,” he said. The percentage is higher among homeowners and green-oriented architects, he said. Wood buying trends bring out strong opinions in him. The popularity of bamboo drives him crazy. Because it’s a grass, bamboo has a green image. But it must be sliced thin and glued together, then shipped from China or southeast Asia. 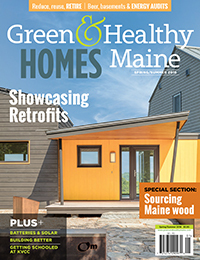 “Wouldn’t flooring or cutting boards of Maine-grown maple be greener?” he asks. Sampson believes the state could do more to promote local woods, including emphasizing growing and marketing hardwoods, and encouraging construction of smaller dry kilns. Most hardwoods are air dried now. With some changes on the supply side and little consumer education, Maine might get a reputation for local woods beyond pine, he said. Which would be a good thing. “The only way the economy is going to work in a forested state is if trees are grown and harvested,” he said. He looks forward to the day when local wood has the cachet of local food. He’s hopeful for the next generation, even though he believes they are more removed from being outside and knowing the trees. “They do have a little more desire to learn and ask if they are making a good environmental decision,” he said.